¿Qué puede tratar la acupuntura? 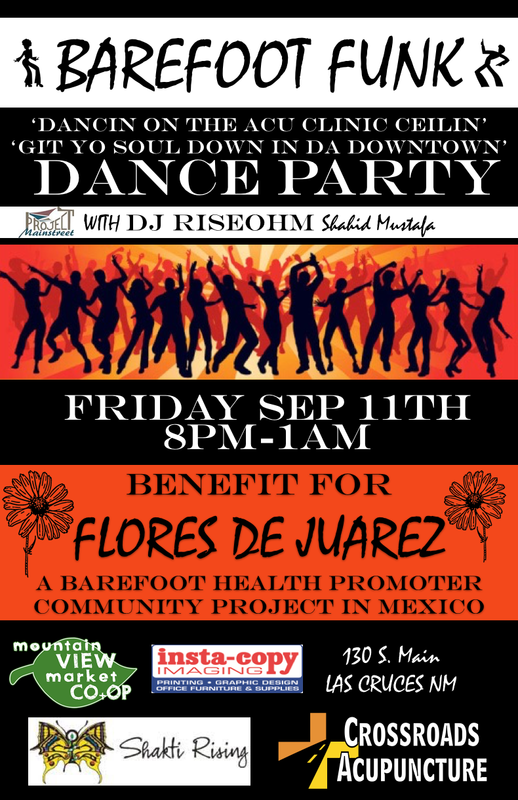 Crossroads Community Supported Healthcare, Project MainStreet, Shakti Rising and Mountain View Market will throw a Downtown Dance Party in Las Cruces, New Mexico on Friday, September 11th. DJ RiseOhm Shahid Mustafa will provide a mix of funk and soul beats at Crossroads’ community center on 130 S. Main. Local food trucks will be there as well. Organizers call the event a “Barefoot Funk Dance Party” to benefit Flores de Juarez, a barefoot health promoter project in Ciudad Juarez, Mexico. This program has offered more than 35,000 free treatments within marginalized and underserved communities in Northern Mexico since 2011. Teachers from Crossroads and Shakti Rising currently offer courses for health promoters at this school, and funds will support their efforts.